Here is our list of 55 (and counting) things to do in Kerala while you are staying with us. Some won't take a minute and others require a little forethought. See how many you can tick off. It started as twenty, then became thirty. Presently it stands at fifty five and will soon stand at 100 if we can get there. Go adventure trekking in Periyar Tiger Reserve at Thekkady. 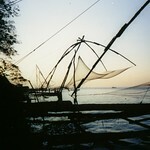 You can help at the nets in For Cochin, but it is most fun during the rainy season with a real fisherman, catching actual fish. Local folks make quick money by placing bets. Take a dip in the mineral waters of Varkala or in the Nelliyampathy forests in Palakkad. Surf, sail, kayak and more! Kerala has bountiful beaches and rivers that are thronged by tourists for water sports. A houseboat cruise offers a wholesome 'Kerala' experience, right from getting a peek into the rural life to watching the fishermen at work. Gaze out of the window as the monsoon rains beat down on your face or experience the lively milieu inside the compartment. Only two families in Aranmula have this mirror making know-how, which has been handed down from generation to generation. Thrissur Pooram (festival) in April or early May is the venue of the largest fireworks display in Kerala. Traditions, age old customs, elephants with pomp and show all add to the festival's fireworks display. Feted as the mother of all festivals, Thrissur Pooram is undeniably the most colourful temple festival of Kerala. Percussion meets pomp with elephant parade, fighting deities and pride all make it a spectacle like no other. Add creative elegance to the walls of your lovely home with these original paintings from the distant land of Kerala. Experience the gaiety of a Pooram. Join in the excitement. Kerala's repertoire of percussion music and instruments is world famous. Cashew nuts come pricey, nonetheless at Kollam you can pick up these exotic nuts at rates that fall easy on your pockets. Watch mesmeric fingers at work with a traditional hand spindle, turning coconut fibres into long ropes. Swoop over the lush green hills of Munnar on a paraglider. The sprawling open windows on both sides of the tuk-tuk would allow you to take a peek at the typical village sights and sounds unlike in a sealed air conditioned cab. Thousands of devout Christians throng the river bank for spiritual enlightenment. 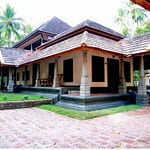 New fashions and trendy styles hit the Kerala market regularly. Buy wooden craft, coir products, brass figurines and more! Kerala is rich in handicrafts. Almost all handicraft centres have extra-ordinary collections of wood, coir shell and sandal wood souvenirs, trinkets, jewellery etc. Banana tree is one of the common plants in Kerala that are abundantly seen in courtyards of houses and grown in groves. Kumarakom bird sanctuary nestled along the famous backwaters of the Vembanad Lake is another essential stopover of bird watchers. This feast is arranged mainly for weddings and during Onam. This tea made in roadside makeshift stalls or mobile stalls and is a competent rival to a luxury hotel's tea. See the Jungle Book characters up close! The zoological parks of Kerala have variety of species. The Thiruvananthapuram zoo is one among the best in Asia. Half the world population of endangered Nilgiri tahr is at Eravikulam National Park at Munnar. Pat and pose for pictures with them. While you are on a holiday to Kerala, you cannot afford to miss out the benefits of a rejuvenating hair massage using warm coconut oil.